Press Release 5.23.18 – HURRICANE SEASON IS UPON US- ARE YOU PREPARED? HURRICANE SEASON IS UPON US- ARE YOU PREPARED? The start of hurricane season is in 9 days, but we are already seeing active weather patterns move into the Gulf of Mexico. Now is the time to make sure hurricane preparations are complete. For a list of emergency preparedness supplies visit our website www.mctxoem.org. 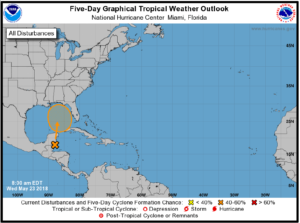 The National Weather Service is predicting a 60% chance of the tropical disturbance to develop into a tropical cyclone sometime between Friday and Sunday. They believe the impacts from this disturbance will be to the east of the Houston/Galveston/southeast Texas region.